Escape the urban bustle at Kentucky Down Under Adventure Zoo and Tall Man's Misery. Do some cultural sightseeing at Hart County Museum and Bill Monroe's Home Place. Go for a jaunt from Mammoth Cave National Park to Mammoth Cave to see Nolin Lake State Park about 42 minutes away. There's much more to do: Head underground at Mammoth Cave National Park, browse the collection at The Book Store, hike along Cedar Sink Trail, and get a dose of the wild on a nature and wildlife tour. To find maps, photos, other places to visit, and more tourist information, go to the Mammoth Cave National Park driving holiday planner . The Route module can give you travel options from your home to Mammoth Cave National Park. In May, plan for daily highs up to 76°F, and evening lows to 56°F. Cap off your sightseeing on the 5th (Sun) early enough to go by car to Nashville. Kick off your visit on the 6th (Mon): explore the world behind art at Frist Art Museum, then examine the collection at Lane Motor Museum, and then get to know the fascinating history of Bicentennial Capitol Mall State Park. Get ready for a full day of sightseeing on the next day: examine the collection at The Johnny Cash Museum & Cafe and then admire the majestic nature at Radnor Lake State Park. For maps, photos, more things to do, and tourist information, you can read our Nashville attractions tool . Drive from Mammoth Cave National Park to Nashville in 2 hours. Alternatively, you can do a combination of taxi and bus. In May, daily temperatures in Nashville can reach 80°F, while at night they dip to 58°F. On the 8th (Wed), wrap the sightseeing up by early afternoon so you can travel to Greenville. The largest city in "upstate" South Carolina, Greenville has grown around the natural wonders of waterfalls located in the downtown area. On the 9th (Thu), immerse yourself in nature at Caesars Head State Park, take in the views from Liberty Bridge, and then admire the sheer force of Falls Park on the Reedy. Keep things going the next day: get all the information you need at BMW Zentrum, then explore the engaging exhibits at The Children's Museum of the Upstate, and then immerse yourself in nature at Table Rock State Park. To see more things to do, where to stay, and other tourist information, you can read our Greenville tour planner. Getting from Nashville to Greenville by combination of flight and taxi takes about 5 hours. Other options: do a combination of flight and bus; or drive. The time zone difference when traveling from Nashville to Greenville is 1 hour. In May, daily temperatures in Greenville can reach 81°F, while at night they dip to 60°F. Finish up your sightseeing early on the 11th (Sat) so you can travel to Broken Bow. Broken Bow is a city in Custer County, Nebraska, United States. Your day-by-day itinerary now includes Sandhills Journey Scenic Byway. To find where to stay, more things to do, and more tourist information, you can read our Broken Bow online trip maker . Traveling by car from Alliance to Broken Bow takes 3.5 hours. Traveling from Alliance to Broken Bow, you'll lose 1 hour due to the time zone difference. Traveling from Alliance in May, you can expect nighttime temperatures to be a bit warmer in Broken Bow, with lows of 46°F. On the 27th (Mon), you'll travel back home. Alliance is a city in Box Butte County, in the northwestern part of the state of Nebraska, in the Great Plains region of the United States. You've now added Carhenge to your itinerary. Start off your visit on the 23rd (Thu): get engrossed in the history at Dobby's Frontier Town, learn more about the world around you at Trailside Museum of Natural History, and then examine the collection at Museum of the Fur Trade. On your second day here, get to know the fascinating history of Ash Hallow State Historical Park and then explore the striking landscape at Courthouse and Jail Rocks. For more things to do, other places to visit, maps, and tourist information, you can read our Alliance trip itinerary planning tool . You can drive from Omaha to Alliance in 7 hours. Alternatively, you can fly. The time zone difference moving from Central Standard Time to Mountain Standard Time is minus 1 hour. Plan for slightly colder temperatures traveling from Omaha in May, with highs in Alliance at 67°F and lows at 39°F. Wrap up your sightseeing by early afternoon on the 25th (Sat) to allow time for travel back home. Start off your visit on the 15th (Wed): explore the striking landscape at Gibbon Falls. 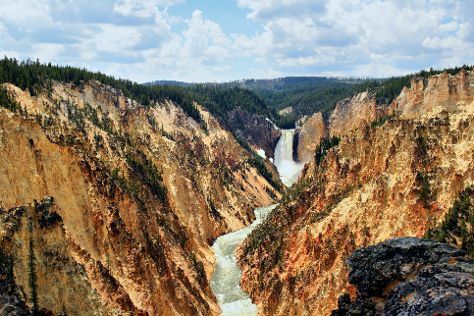 Here are some ideas for day two: appreciate the extensive heritage of Uncle Tom's Trail and then explore the stunning scenery at Grand Canyon of the Yellowstone. To find other places to visit, where to stay, and tourist information, refer to the Yellowstone National Park online tour itinerary maker . Use the Route module to find suitable travel options from Alliance to Yellowstone National Park. Expect slightly colder temperatures when traveling from Alliance in May; daily highs in Yellowstone National Park reach 53°F and lows reach 27°F. Wrap up your sightseeing by early afternoon on the 17th (Fri) to allow enough time to travel to Yosemite National Park. 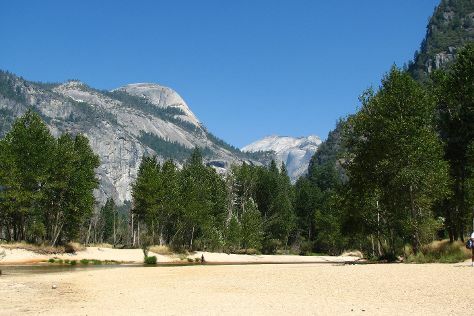 Start off your visit on the 18th (Sat): contemplate the waterfront views at Cathedral Beach Picnic Area, then explore the striking landscape at Sentinel Dome, and then take in the dramatic natural features at Glacier Point. On the 19th (Sun), you'll have a packed day of sightseeing: trek along Panorama Trail. For reviews, ratings, maps, and more tourist information, read our Yosemite National Park trip itinerary planning tool . Traveling by combination of car and flight from Yellowstone National Park to Yosemite National Park takes 10 hours. Alternatively, you can do a combination of car, flight, and bus. The time zone difference moving from Mountain Standard Time (MST) to Pacific Standard Time (PST) is minus 1 hour. Traveling from Yellowstone National Park in May, things will get a bit warmer in Yosemite National Park: highs are around 65°F and lows about 34°F. Wrap up your sightseeing by early afternoon on the 19th (Sun) to allow enough time to travel to Palmdale. Palmdale is a city in the center of northern Los Angeles County in the U.S. Start off your visit on the 20th (Mon): trek along Barrell Springs Trail, then look for gifts at Charlie Brown Farms, and then wander the streets of The BLVD. To see other places to visit, traveler tips, where to stay, and more tourist information, read Palmdale online trip itinerary planner . The Route module can help you plan travel from Yosemite National Park to Palmdale. Expect somewhat warmer temperatures when traveling from Yosemite National Park in May; daily highs in Palmdale reach 81°F and lows reach 54°F. Wrap up your sightseeing on the 21st (Tue) early enough to travel to Las Vegas. On the 21st (Tue), see the interesting displays at The Mob Museum and then see the world from above with a helicopter tour. On the 22nd (Wed), you'll have a packed day of sightseeing: see the interesting displays at The Neon Museum, examine the collection at Pinball Hall of Fame, then kick back and relax at Willow Beach, and finally ponder the design of Bellagio Fountains. For other places to visit, traveler tips, maps, and more tourist information, refer to the Las Vegas day trip planner . The Route module can help you plan travel from Palmdale to Las Vegas. Expect somewhat warmer temperatures when traveling from Palmdale in May; daily highs in Las Vegas reach 87°F and lows reach 64°F. Wrap up your sightseeing by early afternoon on the 23rd (Thu) to allow enough time to drive to Zion National Park. On your second day here, explore the striking landscape of The Narrows. Quickly create a custom-made itinerary for Zion National Park using our trip planner. Getting from Las Vegas to Zion National Park by car takes about 3 hours. Other options: do a combination of flight and taxi; or do a combination of flight and car. The time zone difference moving from Pacific Standard Time (PST) to Mountain Standard Time (MST) is 1 hour. Expect little chillier weather when traveling from Las Vegas in May: highs in Zion National Park hover around 76°F, while lows dip to 41°F. You'll set off for home on the 26th (Sun).